Now you don’t have to pay the steep markup for regular scheduled maintenance that the dealer charges. 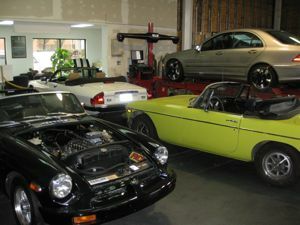 We service all models from Jaguar, Land Rover, Bentley, Lamborghini, Lotus, Rolls Royce, and more. Let our ASE certified technicians as well as master technicians maintain your vehicle all while making sure your factory warranty remains intact. Contact us, we are sure we can help you save on your next common service. Regular maintenance of your vehicle is a great idea, especially at the factory specified intervals including the 30k mile service, 60k mile service, 90k mile service, and the 120k mile service. The great part about our service is that we take care to inspect your vehicle and make sure their aren’t additional areas that might need attention. This can include worn hoses, low fluid levels, damaged or worn parts, noisy belts, old spark plugs, and other main engine problem areas. In addition, a close inspection of the safety and braking system, air conditioning and cooling system, battery, and overall vehicle health is also important at this time. Your vehicle owners manual usually identifies what each factory scheduled maintenance covers, and we will follow the recommendations for replacement parts and fluids which may include the engine oil, coolant, power steering fluids, air filters, cabin filters, and more. Since this is a more extensive service, it is usually best that you plan for this type of maintenance, since the cost can vary based on your vehicle requirements. However, here at Bacchus British Services in Dublin, CA, we always strive to provide you with the fairest price and best quality workmanship so that you can rest easy when we care for your scheduled vehicle maintenance.